My parents sell hardware and housewares at a flea market. They’ve been doing this for 30 years. They’re now well into their 80s. This is probably what keeps them going, the trek every Sunday to the old warehouse where they banter with their neighboring dealers and try to extract money from the strolling looky-loos. They started out at a flea market on Cape Cod, so naturally they carried lots of rope for boaters. Manila, nylon, polypropylene, pre-packed in plastic bags or hanked by Dad, in widths up to 1-1/2”. Dad even built a machine to measure and cut off set lengths of rope. But Dad’s doctor told him he was ruining his health hauling their merchandise from the house to the flea market and back again. Dad compromised by finding an indoor flea market where they could keep their stuff locked up during the week. Unfortunately, this flea market was inland, which meant no boaters and no demand for all the rope they had left. This stuff lay coiled in cardboard produce boxes stacked in our basement. These stacks created narrow valleys down which I walked with fear and loathing, knowing that someday they would all belong to me. It didn’t help that Dad had no inventory. It’s tough to lure customers when you can’t tell them what you have but you can tell them they’ll have to travel underground to get it. It also doesn’t help that my parents are natural-born packrats. If they could catch something, they’d keep it. When I first brought Special D home to meet them, they brought out their wedding photos, my baby photos, and a piece of wood into which I’d banged nails when I was 3. Given all that and the Mogen David they served us at dinner (in paper cups), I’m surprised that I ever got married. In January I placed an ad on Craigslist to try to sell some rope. Surely I could find someone with a sense of adventure and a willingness to be surprised? The first few inquiries led nowhere, but then I was contacted by Yasmin, who represented an artists’ collective in nearby New Bedford. They were building a sculpture to honor New Bedford’s waterfront and fishermen, but when they went shopping for rope they went into sticker shock. Yasmin was delegated to find dirt cheap rope, fast. She turned to Craigslist. Dad was skeptical at first, and hated the idea of just giving the rope away. (I asked Yasmin for a token payment of $50.) But Dad had been staring at these boxes for 20 years with no ideas on how to move them out of his life, and he had finally had enough. Without any persuasion from me, he agreed to what was essentially a donation. I arranged for Yasmin and her two cohorts to come for the rope while I was visiting in February. We filled the van with 25 boxes. Topside, in the fresh, icy air, the ladies pooled their cash and came up with $150. 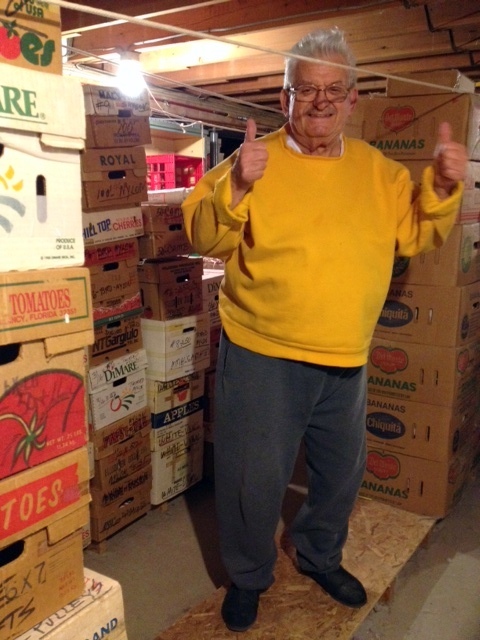 When they brought it down to Dad in the basement, he was thrilled! Plus they’re coming back in a month for the rest of the load – another 25 boxes. When they do, Mom will serve them tea and they can all sit around and admire the cat. And in July, when our family gathers at the old homestead, we’ll convoy to New Bedford to see what all this rope has wrought. My father, patron of the arts. Here comes the second miracle. 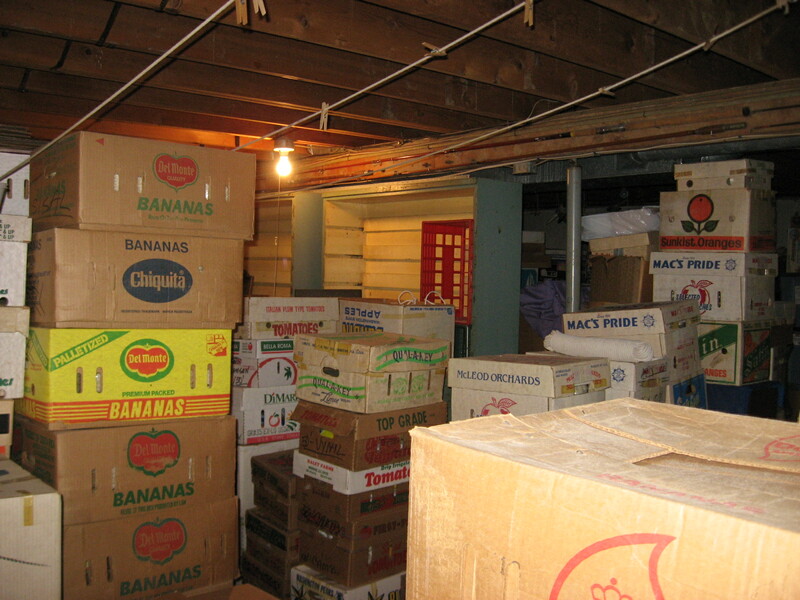 With all those boxes gone, I could see into the core of the basement for the first time since Bush invaded Panama. There sat two huge blue tables that Dad had bought at auction years ago, disassembled, reassembled in the basement, and then left to their own devices. They had high backs – they’d originally been used at the post office to sort mail. They stand out, when nothing is standing around them to blot them out. I felt as if we’d uncovered an ancient shoreline. The tables had accumulated a fair share of boxes and bags. Some subterranean tug at my memory drew me to them. I spotted a sealed box with my name on it. Inside I found all the letters I received in the 1970s, all of my school papers, all of the columns I wrote for the town newspaper, birthday cards, negatives, and even my high school diploma. I thought all this had been lost! No, I packed it away at the end of 1979, right before I moved to Seattle. There are chambers in the tombs of the pharaohs that are filled from floor to ceiling with nothing more than 3,000 years of drifting motes of dust. Something like that happened in the house where I grew up. The boxes kept stacking until my box disappeared. I had no visual cue to remind me. My nephew once told me that he wanted to make a discovery in his grandparents’ basement. I told him as kindly as I could that there was nothing down there to discover. Guess again, Stevie. The lesson here is that you never know when you’re going to make a discovery, but if you close your mind to the possibility, you definitely won’t. And that’s what I did on my midwinter vacation. Obviously there’s still plenty of stuff for everybody. “New Bedford Harbor in a New Light” runs from May 21 to August 22, 2013. I can’t wait to see it! LOOK at those boxes!! You have GOT to be the luckiest son ever born!!! To have parents that know the true value of STUFF is a yearning so many of us have or once had. I’m quaking and quivering as I write. “The world in a grain of sand, Stevie, the world in a grain of sand.”…… “all the grains of sand in the world?” Awestruck. Dumbstruck. Struckless! You’ll be struck dumb when I inherit this crap and send a truckload your way! “The Wrong Novel”–what a great title! I would totally read that. What a wonderful story – I know it must have been a challenge for your father to disentangle himself from the rope and yet he succeeded with knot a look back. A patron of the arts indeed. There are too many puns in a story like this. A third miracle: finding a novel in a blog. If this were chapter one of a novel, I would absolutely keep reading. And I look forward to the picture of the New Bedford rope sculpture. I hope I’m not working on the wrong novel!! !